Tucsonan Kirsten Cummins started a Facebook group that votes each month on which local businesses to patronize. On a recent Saturday in July, business was booming at Teresa’s Mosaic Cafe. What executive chef David Matias didn’t know was that the west-side business had been targeted by a cash mob. Like flash mobs, cash mobs also involve organized groups converging on predetermined locations, but for the purpose of infusing local businesses with money and support. This national trend is said to have begun in about 2011 and has since spread to dozens of U.S. cities, including Tucson. 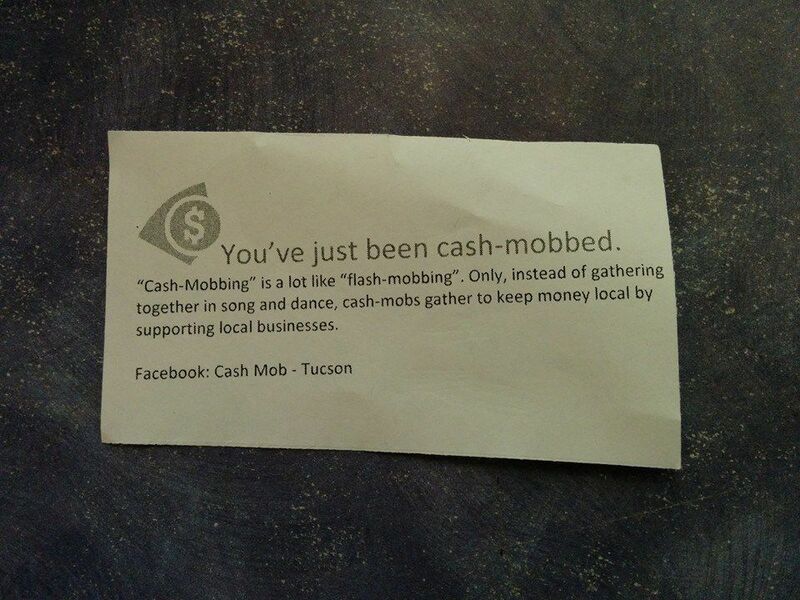 Tucson resident Kirsten Cummins gathers people interested in cash mobbing through her “Cash Mob — Tucson, AZ” Facebook group, made up of more than 140 members. The group votes each month on which local business to patronize and when. Cummins was inspired to start the Tucson movement after hearing about cash mobbing in another city. When the Tucson group began in 2013, the cash mobs targeted local farmers markets. They have since expanded to businesses ranging from hobby shops to restaurants. In addition to boosting the local economy, cash mobbing introduces Tucsonans to local businesses they may not otherwise know about, Cummins said. The study also suggests that four times more dollars stay in the community when spent at local businesses as opposed to spending at a chain or big box store. Local First Arizona, a group that aims to strengthen and promote local businesses to the community, recalls the cash-mobbing trend being popular in Phoenix five to six years ago. Still, the cash-mobbing movement can be a helpful tool to boost the local economy, said Southern Arizona Director of Local First Arizona Michael Peel. Coralie Satta’s restaurant, Ghini’s French Caffe, was cash-mobbed by the group on Sunday, June 11. But Satta did not notice much of a difference at the business, at 1803 E. Prince Road. The concept of cash mobs could be helpful depending on the day the group chooses to support the business, Satta said. At Teresa’s Mosaic Cafe, 2456 N. Silver Mosaic Drive, Matias said the increase was noticeable. “We were busier that day, but we didn’t know why we were busy” said Matias. The family-owned business took in about $400 more than average, according to Matias. “I had one person think it was a coupon and I had to clarify it was just a message saying, ‘I’m here on purpose to give you monetary love,’” Cummins said. Going forward, Cummins hopes the group continues to grow and foster a sense of camaraderie. The next cash-mob event will be held at La Indita at 622 N. Fourth Ave., on Aug. 20, starting at 9 a.m.
Strong work ethic, community connections keep Claire Grunstein going.